Creation: Appeared July 1935 as a renumbering of a large chunk of VA 5 running generally as it does now. It eastern end was at 2nd St at Broad, where it ran into US 60. Adjustments: In Oct 1935 (CTB), US 250 was rerouted in Charlottesville. Initially it used Main St, then EB 5th and WB 2nd, Jefferson St, Park St, High St (also partly Free Bridge Rd then). With this change, US 250 used Main St, then EB Water/2nd and WB 1st, High St, Locust Ave, and Watson St/Long Ave (this is now part of the 250 bypass). In Sept 1937 (CTB), US 250 was put on new routing west of Ivy, leaving behind SRs 738 and 739 (now partly SR 786). In 1938, US 250 was rerouted between Churchville and Staunton onto its current path. US 250 originally used the SR 840 loop, then used SR 721 south a bit, crossed Middle River, then used SR 722 north back to current US 250. In May 1939 (CTB), The Route 250 Association requested that US 250 be extended along US 60 east to Old Point Comfort. There was no decision given on that in the CTB but this did not ever happen. US 250 had a gap in it at Shadwell. To connect, one had to use VA 22 to SR 729 (no longer connects to VA 22) south to SR 731 east to US 250. The gap was closed about 1939 with US 250's current bridge over the railroad at Shadwell. Sometime in the late 30s, US 250 was given its current routing just west of US 29, leaving behind SR 601/754. In Jan 1941 (CTB), US 250 was given its current routing bypassing the village of Afton, leaving behind SR 750 and a bit of VA 151 (now VA 6). In Nov 1942 (CTB), US 250 was removed from Crozet and placed on its current bypass there. This was a replacement of VA 240. The E-W part of the old route became VA 240 and the N-S piece became VA 230 (now also VA 240). In Sept 1945 (CTB), US 250 was removed from SR 796 in western Albemarle County. Also, US 250 bypassed Yancey Mills, leaving behind SR 797. 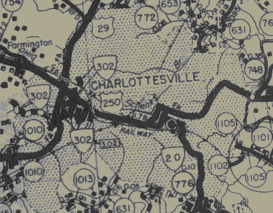 In Nov 1948 (CTB), US 250 was rerouted within Charlottesville. In this change, WB now used High/Preston/Grady/Rugby/Main (this is still WB US 250 Business' route). EB now used Main/Water/7th/High. Between 1955-58, US 250 was moved to its bypass of central Waynesboro, replacing US 250-A. The old route on Main St remained US 340. About 1969, US 250 was placed on its current Charlottesville Bypass replacing US 250-A. US 250 through Charlottesville became US 250 Business (EB has been rerouted since). In June 1974 (CTB), US 250 was extended east along Broad St replacing US 60 to end at 21st St which is where US 60 now met Broad. In Sept 2003 (CTB), US 250 east was truncated to US 360 when US 60 was removed from Broad St altogether. Improvements: Upon designation, US 250 was paved everywhere except WV Line to Monterey. US 250 was paved west of Monterey in 1939. In 1969, US 250 was 4-laned from US 29 east to just short of US 250 bus/VA 20 when it was placed on the Charlottesville Bypass. In 1970, US 250 was widened from SR 654 Barracks Rd to US 29; Broad St was 4-laned out to Glenside Dr. In 1975, US 250 was multilaned the rest of the way between US 250 bus and SR 654. In 1979, US 250 Broad St was 4-laned from Glenside Dr to Parham Rd. 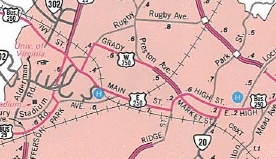 In 1983 or 1984, US 250 Broad St was 4-laned from Parham Rd to VA 157. In 1993, US 250 was 4-laned from I-64 Shadwell west to Locust Ave (Charlottesville Bypass now all 4-laned, even though officials all through the 1970s showed this erroneously). In 1997 or 1998, US 250 was widened from I-64 Short Pump west to the Goochland Line. Posted: Fully posted; Cutouts in Staunton and Highland County still plentiful into 2013; Richmond cutouts went away in mid-2000s. In the late 1990s there was an error VA 250 shield WB leaving VA 157. US 250 is poorly posted east of US 1-301 and back to at least 1981 is not posted east of I-95. Truck Route: A posted truck route for Staunton appeared about 1999. Runs from US 250 along VA 261 to US 11 north to VA 262 west back around to US 250 west of Staunton. It is very well posted. Comment: US 250 is kind of a forgotten highway in most parts of Virginia. It is closely paralleled by I-64 from Staunton to Richmond and west of Staunton runs through pretty unpopulated territory. US 250 is however a wonderful, peaceful drive when not in the cities. West of Staunton it is quite scenic, especially in Highland County. 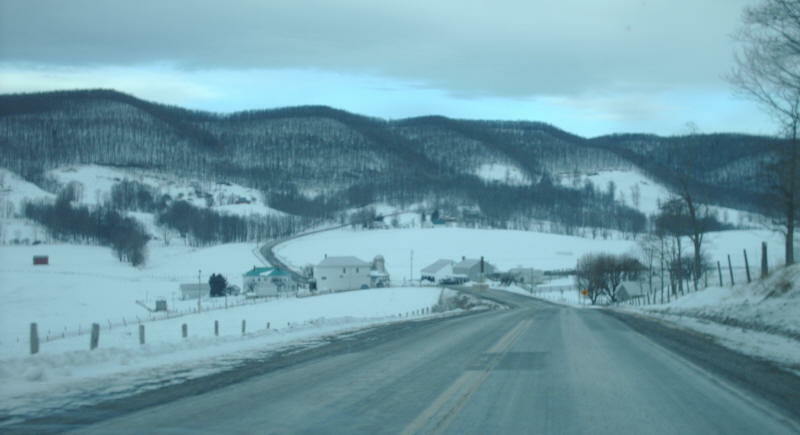 US 250 has several mountain range crossings west of Staunton. The worst is at the Augusta-Highland Line but the others are not all that bad. The crossing at Afton Mtn can actually be driven at 55 mph. VDOT Traffic logs back to at least 2001 say that US 250 is on split streets in downtown Staunton, with WB using New St. However, US 250 is not posted this way in the field. 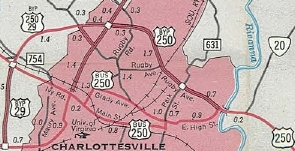 US 250 is misidentified as VA 5 in both the Staunton and Charlottesville insets of the 1936 Official. About 1977, US 250 Bus EB was rerouted again to use its current routing: Main-McIntire-Market-9th-High. WB is multilaned on Preston Av from McIntire to Rosser. Although US 250 Business is on "one-way splits" for a large chunk of its route, the streets are actually 2-way traffic on 2-lane roads. Comment: US 250 Business passes through part of the University of Virginia campus. 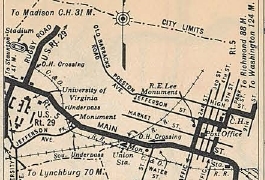 US 250 ALT #1: First appeared in the May 1952 CTB minutes as the route designation for the Charlottesville Bypass, which is shown as open from US 29 east to US 250/VA 20 beginning with the 1955 Official. In 1961, US 250-A was extended west as new construction around to meet US 250, forming a complete bypass. About 1969, US 250-A became mainline US 250. US 250 ALT #2: Appears in the CTB minutes in 1955 and 1960 as the bypass of central Waynesboro. 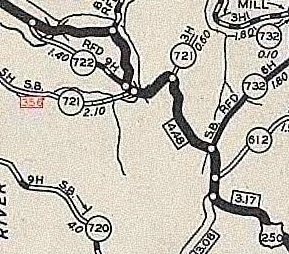 The bridge over South River is dated 1956 and the 1958 Augusta County map shows it as mainline US 250. To this point it is unclear if this was ever labeled on a map or signed as US 250-A.